A current research project in the College of Engineering and Computer Science could help reduce the number of suicides that occur each year by analyzing social media data generated by depressed patients and alerting their caregivers in time to intervene quickly. Graduate student Pranika Jain, College of Engineering & Computer Science Professor Chilukuri Mohan and graduate student Siddhartha Roy Nandi, from left, are working on the new app to examine subjects’ social media postings. 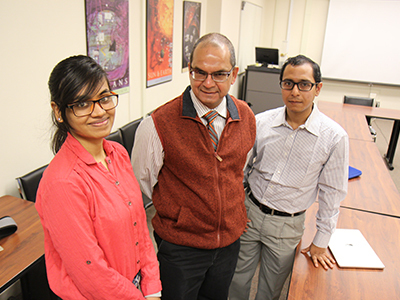 Graduate students Pranika Jain and Siddhartha Roy Nandi, under the supervision of Professor Chilukuri Mohan, are developing an Android app designed to be installed on psychiatrists’ smartphones. If a patient agrees, the app monitors their social media posts and can trigger an alert if it detects significant risk indicators in the language used in posts or in the patient’s posting patterns over time. “If there is some unusual behavior or some indicator of self-harm, an alert is generated and sent to the doctor,” says Jain. If the primary mental health care-giver is unavailable, the alert would be routed to another responsible care-giver, possibly through a healthcare organization, with steps taken to protect patient data privacy. “Only when abnormal situations arise which require urgent action, that’s when the physician will be alerted and they can look into it,” says Mohan. In the pilot phase, the team is working with psychiatrists to refine the algorithm’s ability to detect concerning posts and reduce potential false alerts. The alert generation process will be sensitive to an individual patient’s social media posting patterns, rather than a one-size-fits-all. Doctors will provide feedback and rank potentially alarming posts on a scale of 1 to 10. Those rankings will be used to fine-tune the patient-specific algorithm parameters. “Based on that, machine learning algorithms help improve analysis of the criticality of the posts and the usefulness of the app,” says Roy Nandi. The project illustrates a unique intersection of technology and complex human emotions. “The sentiment analysis looks at the words they are using—are they positive or negative words?” says Roy Nandi. By comparing a new post to the past history of a patient’s postings, the app has a context for detecting anomalies—potentially troubling posts that can generate an alert. “With the help of the doctors, I hope we can save some lives,” says Roy Nandi. This work is being completed in collaboration with Research Professor Kishan Mehrotra and Linguistics Professor Tej Bhatia at SU, Dr. Mantosh Dewan and Dr. Seetha Ramanathan at Upstate Medical University, and Dr. Dayaprasad Kulkarni, founder/director of Aarogyaseva: Global Healthcare Volunteer Alliance.